Alaro City is a similar scale and type as others in our portfolio. 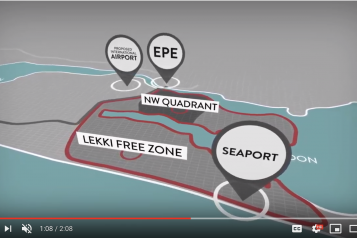 Rendeavour’s development site is located on 1,000 ha (2,470 acres) within the Lekki Free Zone, the largest free zone in West Africa. The site is adjacent to the approved location for the proposed Lekki International Airport and in close proximity to the deep sea port and a number of planned industrial developments. The project is underway with bulk infrastructure roll out and our first developers already constructing. The Rendeavour project is a joint venture with the Lagos State Government. Nigeria is one of the most rapidly growing countries in the world, with an 80% population increase expected by 2025. Lagos, the country’s commercial capital and nerve centre, is predicted to be the world’s fourth most populous city by 2050. The Lekki region is one of the most dynamic growth regions in Lagos State, with potential to accommodate a population of around 3.4mn. The government’s development plans include office, residential, medical and industrial real estate. Lagos has an urbanisation growth rate of 16%. Lagos, Nigeria's commercial capital and nerve centre, is predicted to be the world’s fourth most populous city by 2050. The Lekki region is one of the most dynamic growth regions in Lagos State, with potential to accommodate a population of around 3.4mn.